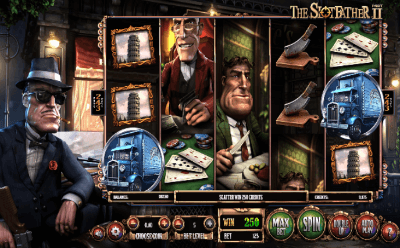 The passion for the first slot machine devoted to the romance of gangster life had not yet subsided, and the developer of Betsoft Gaming decided to release a sequel – The SlotFather Part II, – no less interesting than the first slot. 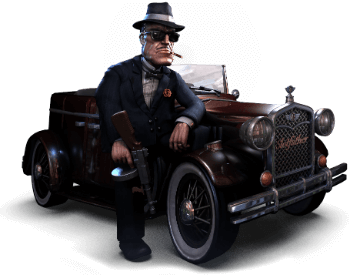 Italian mafia, performed in 3D, shootings, chases and suitcases of money are waiting for the player. The machine is made in the classical format of five coils. Combinations are formed from the same symbols in 243 possible variants starting from the first on the left of the reel. The player can choose the value of the coin and the number of coins for the round (from 1 to 10). An automatic game is available, as well as a game for doubling winnings. The risk game suggests guessing which side the coin will be dropped on – an eagle or tails. Simple images – a picture of the Tower of Pisa, a butcher's hatchet, a whiskey with a cigar, a bundle of money, playing cards and chips, a portrait of the boss. You need at least three identical simple images – one in each column to get a win. Scatter is a collection machine – it brings prizes regardless of the location on the field. You will need at least 2 such symbols to get a win. Three scatters and more bring from 8 to 20 free spins. Gangster Feature. Three identical images on the neighboring reels are transferred to the bonus game. A gambler should choose one of the suggested cards. Free Spins are activated after three or more scatters appear on the field. During the round of free spins, all coefficients are doubled. Wild falls on all the coils, except the first on the left. The number of free spins can be increased with the help of scatters. After a round of free spin, the boss hands the player an extra Big Boss Bonus prize. The company BetSoft succeeded another masterpiece The SlotFather Part II with interesting gameplay, excellent graphics and a fair amount of humor. The slot is funny and very generous, full of bonus features and symbols with special features.